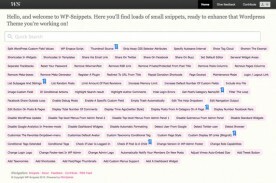 Check out the http://wp-snippets.com/, an interesting site for all the wordpress developer. With the help of this site, you don’t need to read through all the documents. You can just jump into the needed snippets. 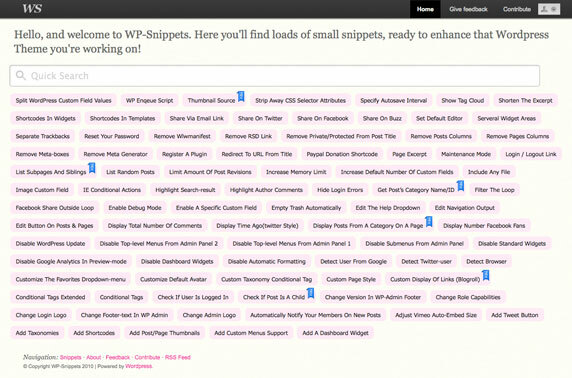 The idea behind WordPress Snippets is simple; to provide small snippets of code, helping you to create a magic WordPress Theme. The original documentation of WordPress is excellent, but not as straight forward as you may want. Straight forward is the lead word for WP Snippets. No talk, just Snippets.